Fine Wire has a reputation for supplying quality products which has lead to repeat business from customers all over the world. Occasionally problems occur but we are here to help and offer a solution to any problem. Defects could be down to the wire manufacturers process, but also some problems can be caused by the users machine. e.g. The wire can be miscast rippled or scraped on customers machines due to misalignment of guides etc. As wire is wound on to the spool, careful adjustment of casting pulley’s ensures that a satisfactory inherent cast is put into the wire. This sounds a fairly simple operation but in practice can be very difficult as fluctuations in tension during the winding process will cause problems in maintaining a consistent cast. Caused mainly by a bad traverse setting during winding or lack of tension control. The traverse length may be underset or overset causing a barrel of diablo shaped spool.The overlapped wire will trap,and become impossible to dewind. Caused by worn or defective “casting pulley’s” or loosely set wire drawing dies.The rippled wire will cause malformed stitches. The wire gauge or size is fundamental to the setting of any machinery and is controlled by the diameter of the bearing in the wire drawing die. Naturally wire drawing dies wear as wire is drawn through them due to great frictional resistance. As the wire drawing die wears then the diameter increases. Sometimes even if the correct die size is employed the wire can “pull down” and a reduction in diameter is experienced. A further defect can occur when there is a breakdown in the wire drawing lubricant and particles of the wire embed themselves in the die, causing it to become elliptical or scraped. a) The degree of reduction of area by cold working imposed on the steel during wire drawing. This is work hardening. b) The gauge at which the wire has a intermediate heat treatment. ie annealing or softening. c) The chemical composition of the steel employed. ie the carbon content. 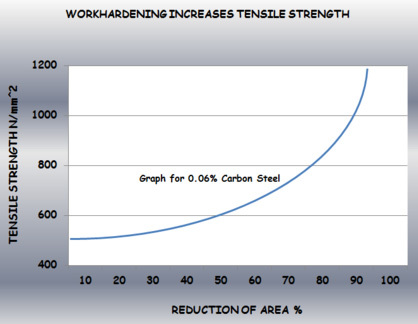 It is important to ensure that the tensile strength is consistent so that it performs repetetively. The type of coating employed for the production of stitching wire is usually an electrolytic deposit of zinc. However, there are alternative coatings of copper, tin or a hot dipped alloy of zinc and tin. The essentials of a good coating are that it should be very smooth and adherent, as any loose coating quickly blocks the stitching head guides. There is always a compromise between producing a wire which is clean enough to eliminate marking the work piece, but at the same time has sufficient residual lubrication to help the wire through the stitching head. The coating offers a degree of corrosion resistance. However, too much coating leads to flaking and blocking of guides.